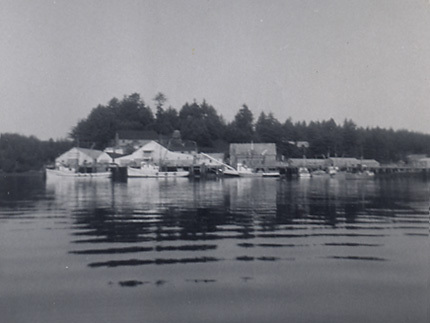 The following 7 photos were generously shared by Verna Bennett from Christine Shanagin Kvasnikoff's collection, and by Tim Smith from the Norman L. Smith collection. 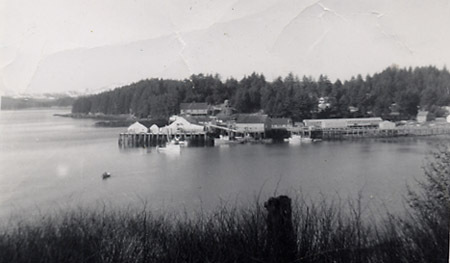 They show Ouzinkie as it was before the 1964 earthquake. 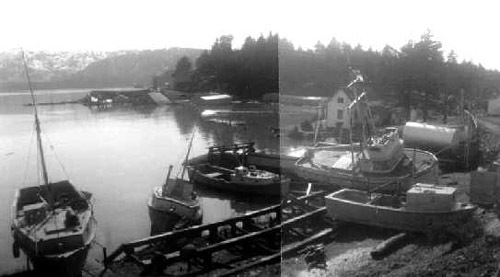 The following 2 photographs generously shared by Verna Bennet from the Christine Shanagin Kvasnikoff collection, and 4 photographs from the Norman L. Smith collection, generously shared by Tim Smith, show the aftermath of the 1964 earthquake and tsunami. 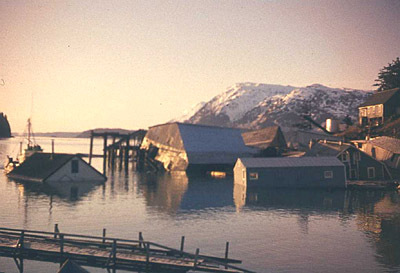 Most of the buildings that were close to the shoreline were destroyed as the water subsided and rose rapidly. 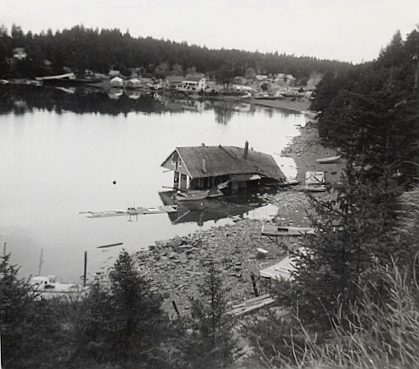 The land sank approximately 5 to 6 feet. 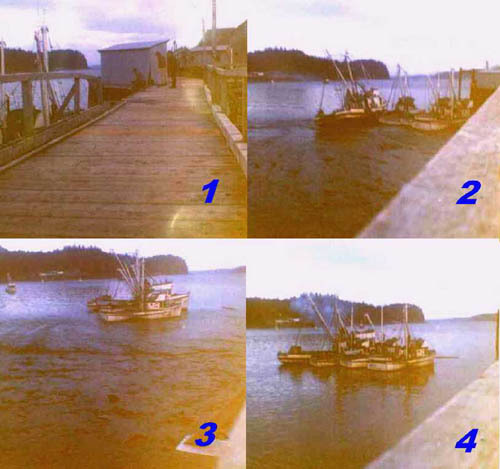 The set of 4 composite photos below is of particular interest, as it shows the subsiding and rising of the water on that unforgettable day. 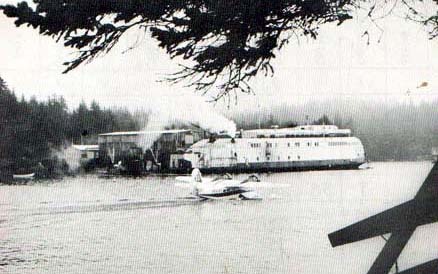 This picture of the Kalakala, formerly a ferry boat, was taken in 1970, and was salvaged from the November 7, 1970 "Island Times" newspaper issue. 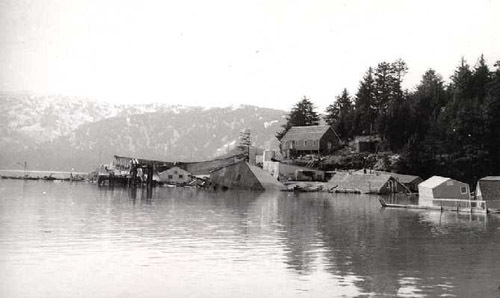 It is docked by the cannery in Ouzinkie harbor that was built after the 1964 tsunami. 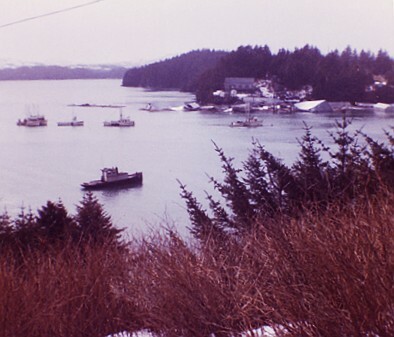 2 boats that are recognized in the picture are the GPC-22 on the left and the Nyad in the foreground. 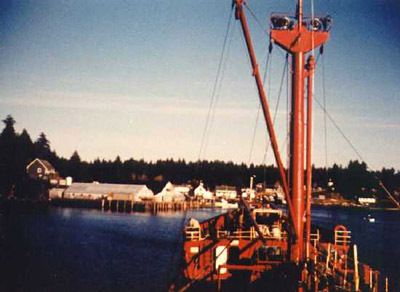 The Kalakala arrived at Ouzinkie in the Summer of 1970. It was then used as a crab processor for 5 months. 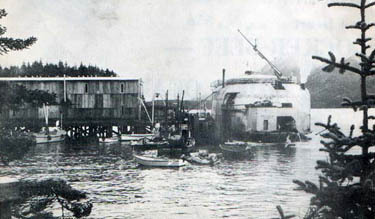 The Kalakala was then moved to Gibson Cove, Kodiak in November, and on Thanksgiving Day at high tide, was moved to a bed where rock was put around her to hold it in position. It was then used to process shrimp. This second picture was taken from near where the Ouzinkie store is located. 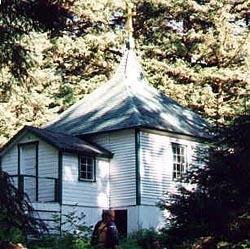 This is the historical chapel in Monk's Lagoon as it looked before undergoing some renovation in 2004. 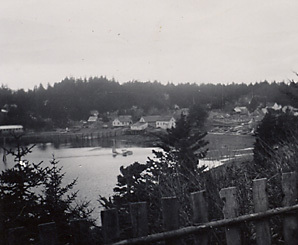 It is located on the Eastern end of Spruce Island, a short distance through the forest from the beach.